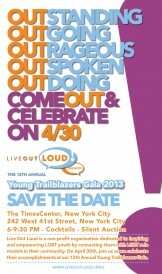 LGBT non-profit organization Live Out Loud is hosting its 12th annual Young Trailblazer’s Gala featuring young professionals in the LGBT community on Tuesday, April 30th. Live Out Loud aims to inspire LGBT youth by connecting them with successful, established professionals in the community. The project was conceived in 2002 and awarded collegiate scholarships to LGBT youths from the New York tri-state area. This year, Live Out Loud will present 5 awards of $5,000 each during the gala. Live Out Loud’s mission has always been “to empower, energize and enable Lesbian, Gay, Bisexual and Transgender Youth to live the life of their dreams through the celebration of the richness and diversity of our shared experience, the visibility of role models and the dissemination of information.” Past attendees of the gala include Lisa Lampanelli, Donny Deutsch, Thom Browne, Ariel Foxman, Michael J. Fox and Sandra Bernhard. Tickets to the event, to be held on Tuesday, April 30th at the TimesCenter in NYC, can be purchased here. Posted April 25th, 2013 & filed under Travel. Are you ready for a ‘Dinah-licious’ weekend?